How does migration change a nation? Germany in Transit is the first sourcebook to illuminate the country's transition into a multiethnic society—from the arrival of the first guest workers in the mid-1950s to the most recent reforms in immigration and citizenship law. The book charts the highly contentious debates about migrant labor, human rights, multiculturalism, and globalization that have unfolded in Germany over the past fifty years—debates that resonate far beyond national borders. 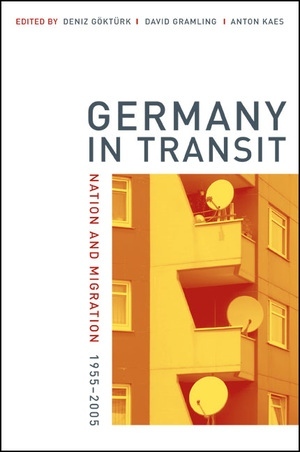 This cultural history in documents offers a rich archive for the comparative study of modern Germany against the backdrop of European integration, transnational migration, and the fall of the Berlin Wall. Divided into eleven thematic chapters, Germany in Transit includes 200 original texts in English translation, as well as a historical introduction, chronology, glossary, bibliography, and filmography. Deniz Göktürk, Associate Professor of German, is author of Künstler, Cowboys, Ingenieure: Kultur- und mediengeschichtliche Studien zu deutschen Amerika-Texten 1912-1920 and coeditor of The German Cinema Book. David Gramling is completing his doctoral thesis on German Turkish literature and the spatial imaginary. Anton Kaes, Chancellor Professor of German and Film Studies, is author of From Hitler to Heimat: The Return of History as Film, M, and coeditor of The Weimar Republic Sourcebook (UC Press). The editors are all affiliated with the German Department at the University of California, Berkeley.